This looks amazing! I’m definitely going to have to try this! I hear quinoa (pronounced KEEN-wah) is really good for you! I used a red quinoa here, but you can use whatever kind you like, white/buff colored seems to be the most common. Also, a few notes and tips from the book: low-fat soy milk may replace the low fat milk, blueberries may replace the blackberries, dark honey may replace the agave nectar, and walnuts may replace the pecans. Combine milk, water and quinoa in a medium saucepan. Bring to a boil over high heat. Reduce heat to medium-low; cover and simmer 15 minutes or until most of the liquid is absorbed. Turn off heat; let stand covered 5 minutes. Stir in blackberries and cinnamon; transfer to four bowls and top with pecans. Drizzle 1 teaspoon agave nectar over each serving. *While the quinoa cooks, roast the pecans in a 350F degree toaster oven for 5 to 6 minutes or in a dry skillet over medium heat for about 3 minutes. 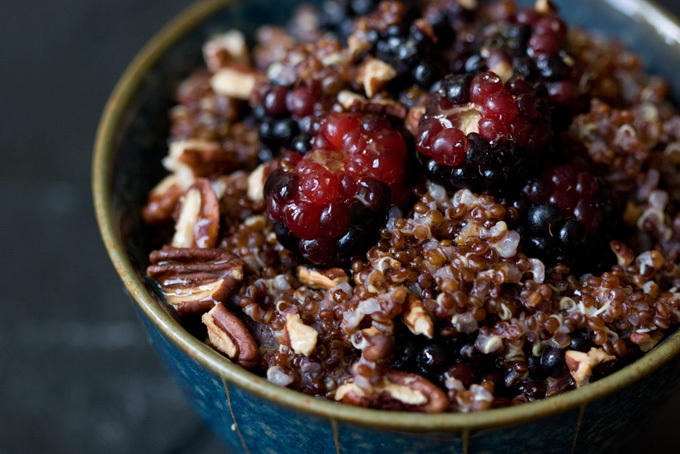 This entry was posted in Recipes and tagged breakfast, quinoa. Bookmark the permalink. Mmmmmm that DOES look amazing!! I’ve heard quinoa is really good for you as well. I eat it sometimes and it’s really fun: it kind of takes on the flavor of the mixed-in foods. Kind of like couscous (only more nutritious from what I’ve heard). This looks great! I just bought some quinoa and it’s sitting in my cupboard waiting to be used so I’m looking forward to trying this recipe. Have you tried this yet?? Looks delicious! I’m trying it this weekend. Just bought the quinoa last night. Looking forward to it. I’ll let you know how it goes. Okay, I made this recipe and served it to my husband, aunt, uncle, and cousin for breakfast this morning. It was fabulous! I didn’t have enough blackberries for the full amount, so I used all the frozen berries I had and thawed them: blackberries, strawberries, raspberries, and blueberries. I served the nuts on the side, since my cousin’s allergic. Everyone enjoyed it! I was nervous because I’d had several people tell me quinoa was not enjoyable even though it was nutritious. I disagree. This was a great recipe! Enjoy it!